Abstract: In the past three decades, government, industry and other stakeholders have repeatedly been swept up with the ‘fuel du jour’, claiming that a particular alternative fuel vehicle (AFV) technology can succeed in replacing conventional gasoline-powered vehicles. However, AFV technologies have experienced relatively little success, with fossil fuels still accounting for about 95% of global transport energy use. 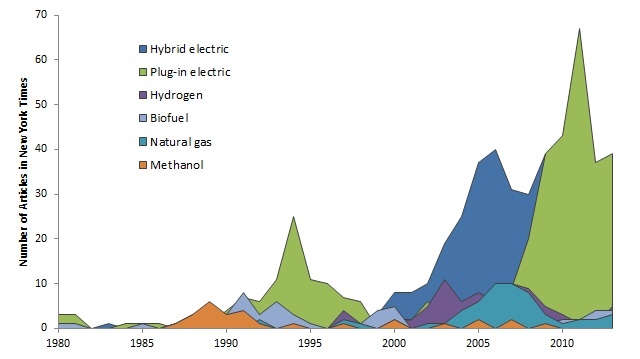 Here, using the US as a case study, we conduct a media analysis to show how society’s attention has skipped among AFV types between 1980 and 2013, including methanol, natural gas, plug-in electric, hybrid electric, hydrogen and biofuels. Although our results provide no indication as to whether hype ultimately has a net positive or negative impact on AFV innovation, we offer several recommendations that governments can follow to move past hype to support significant AFV adoption and displace fossil fuel use in the transportation sector. Full Citation: Melton, N., J. Axsen & D. Sperling. 2016. Moving beyond alternative fuel hype to decarbonize transportation. Nature Energy, 1, 16013.